Ajalee Claudio is the beautiful daughter of Lavagn and Janet Claudio, who resides in the Indian Orchard section of Springfield. 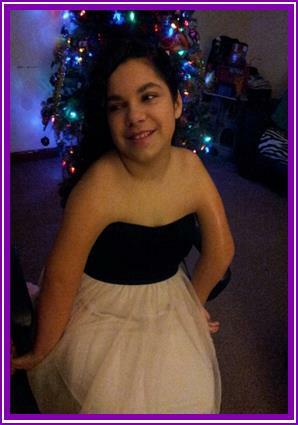 She is an 11 year-old who was born on March 3, 2002 with Arthrogryposis Multiplex congenital. She has one brother. Ajalee is in the 6th grade and attends Chestnut Middle School. She is an excellent student and excels in the subject of Language Arts. She is an avid writer and has written some gospel rap songs which she has performed with her father’s gospel rap group. While she presents as being shy, she says “When I am performing for the Lord, all of my fears go away”. Ajalee’s condition affects her muscular system. She is non-ambulatory and requires a wheelchair for mobility. She has limited use of her arms and hands. She presently has a motorized wheelchair that she uses at school. However, her ability to attend community events or her favorite activities, which include wheelchair soccer, wheelchair basketball and wheelchair dance, is hampered by the fact that the family van is not equipped with a ramp that will accommodate her motorized wheelchair. Her motorized chair weighs more than 400 pounds. At this time, the family feels that what’s most important is assistance with Ajalee’s transportation needs. The Claudio family has a strong faith rooted in God and trust that HE will bless Ajalee with a miracle and, that someday she will walk. Until then, she needs to get out there and experience the freedom of movement that will enhance her daily living. The Claudio family are members of Restoration Worship Center, where their Senior Pastor is Eli Serrano. Ms. Ethel M. Hudson was born on August 19, 1924, in Springfield MA to Reverend and Mrs. Charles C. Baisden. She became the wife of Mr. George H. Wallace (deceased) and had four children. She is a proud grandmother of seven and great grandmother of ten. Sister Hudson attended Springfield Public Schools and worked at the Springfield Armory during World War II. She was the first African American manager at the former Forbes & Wallace department store, where she managed 33 departments. She retired from the Springfield Police Department after 15 years as a communications operator. She is currently an active member of the Board of Directors at Independence Seniority and Costello House in Springfield. Sister Hudson played an active role at the Frank Hatchett School of Dance, where she participated in the dance and modeling programs. She also designed and sewed costumes for the Hatchett dance recitals. Sister Hudson is a former member of Third Baptist Church, where she attended service and worked with various ministries for over 40 years. She was involved in the Sunday school program, as well as the music ministry. Under the direction of Mrs. Josephine Fullilove, she became a member of the Sanctuary Choir and soon was asked to be the assistant director. She was also a member of the Fullilove Ensemble and the Pearl Gospel Singers. Upon joining Canaan Baptist Church of Christ, she became the director of youth ministry, assistant director of the Freedom Choir, assistant director of Voices of Promise, and Secretary of the Christian Education Ministry. She is an active member of Our Crowd, Ltd., an organization that awards scholarships to deserving youth to help further their education. In 2001, Sister Hudson competed for the title of Ms. Senior Massachusetts Golden Girl, and was the first runner up in the pageant. Sister Hudson’s motto is“If I can help somebody as I travel this life, then my living has not been in vain”.